College basketball will get underway in earnest on Nov. 6. Though the day on the calendar is one of relative insignificance (save for 2018, which happens to be Election Day), some may confuse it with Independence Day because of the explosion of popularity the sport will see that Tuesday. And what a way to start the season. By my count, there are three can't-miss college hoops non-conference games to watch that day when the season begins -- most notably Duke vs. Kentucky and Kansas vs. Michigan State, a blueblood bonanza that will steal center stage as part of the Champions Classic. Let's take a look at some of the other notable games to watch in the early portion of the non-conference slate not only on opening day, but for the entire months of November and December. First up among the best of the early non-conference season is the most appetizing: Kentucky vs. Duke, one blueblood with national title aspirations against another. Both UK and Duke are 1 and 3 respectively in the preseason CBS Sports Top 25 (and one), and this juicy opening-day doozy comes courtesy of a doubleheader as part of the State Farm Champions Classic. Storylines abound in this one. Which one-and-done reliant program can outduel the other? Which Hall of Fame coach schemes up a win? The most enticing storyline of all is the possibility that this will be No. 1 vs. No. 3 to tip the season off. In any other venue, Michigan State-Kansas would be the headliner of the Champions Classic. But incredibly, thanks to Kentucky-Duke, this game might somehow be overshadowed on opening day. Nonetheless, it's still one of the top non-conference games of the early season. In Michigan State, you've got a team looking to replace two lottery talents in Miles Bridges and Jaren Jackson. In Kansas, you've got a team replacing Devonte' Graham and Svi Mykhailiuk. But star power is still abundant on both rosters, and on both sidelines, with Hall of Fame coach Bill Self looking to go all-square against fellow Hall of Famer Tom Izzo. Izzo holds a 4-3 advantage, but lost 90-70 in 2017 when they faced off in the NCAA Tournament. Who doesn't want to catch a little Sunshine Showdown on opening day? This rivalry between Florida State and Florida is as hot as the sun. Though it's most widely known for its intensity in football, it does translate to basketball, too. The Gators have traditionally dominated the series overall and own a 43-25 advantage, but Florida State has won the last four games of the series. The Seminoles, who are No. 14 in the CBS Sports Top 25 (and one), are going to be favored to make it five straight thanks largely to Phil Cofer being granted a fifth year of eligibility. When have we seen these two teams face off against one another? Michigan vs. Villanova ... oh, that's right, they played one another in the 2018 national championship! Villanova got the better of the two in that early April showdown, and it will be favored to do so again when it faces the Wolverines on Nov. 14 -- but not by much. Michigan is bringing back Charles Matthews, Zavier Simpson, Jordan Poole and Isaiah Livers from its national runner-up squad. Villanova, meanwhile, is replacing Jalen Brunson, Omari Spellman, Mikal Bridges and title game hero Donte DiVincenzo. Steve Alford will have a tough time replacing Aaron Holiday and Thomas Welsh, but he's set himself up well by recruiting at an elite pace. The Bruins have a top-10 incoming freshman class, two stud sophomores to build around in Kris Wilkes and Jaylen Hands, and a dynamic big man in Moses Brown, a member of UCLA's freshman class, who is going to surprise some folks. Talent-wise, the Bruins match up very well against an experienced Michigan State team that returns Cassius Winston, Nick Ward, Joshua Langford, Matt McQuaid and other valuable pieces for a Thanksgiving night game. Speaking of rousing rematches from last season, does a Sweet 16 do-over sound intriguing? How about one that featured 137 total points, a go-ahead bucket in the final seconds, and a roller coaster of a ride that included a nearly-epic comeback? We're running that one back on Nov. 27 when Loyola-Chicago -- the Cinderella of the 2018 NCAA Tournament -- rematches with Nevada. This time around, Nevada may be in for some payback. The Wolf Pack are loaded with talent, and come in at No. 6 in the CBS Sports Top 25 (and one). Loyola isn't far off though. It could be a preseason top 25 squad. 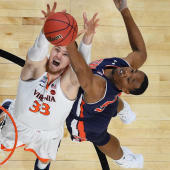 I'm not ruffling any feathers by tabbing Duke-Indiana the must-watch ACC/Big Ten Challenge game, but Maryland-Virginia is a close runner-up here for me. The Terrapins bring back Anthony Cowan and Bruno Fernando from last year's team, and it's not unrealistic to think they could be a darkhorse to challenge for the Big Ten. As for Virginia, the reigning ACC regular-season champs, it returns Kyle Guy, Ty Jerome and De'Andre Hunter, among others. An historic loss to UMBC as a No. 1 seed in the NCAA Tournament last season won't stop the Cavaliers from being a force again next year. Maryland will have its hands full on its own turf. Florida State has the better team, Purdue has the best player in Carsen Edwards. So what gives? This should be a fun one to watch as part of the ACC/Big Ten Challenge. Edwards is going to put up numbers no matter the outcome. Michigan and North Carolina met last season, and the Tar Heels bested the Wolverines on Tobacco Road. This time around it's UNC paying a visit to Ann Arbor, where it looks to get a little taste of revenge. Come for the coaching matchup between Roy Williams and John Beilein, stay for the talent on the court that features Nassir Little, Ignas Brazdeikis, Brandon Johns, Jordan Poole and Charles Matthews. No, this isn't an amalgamated football and hoops post! Both Clemson and Mississippi State are going to be pretty great next season on the hardwood. Brad Brownell and the Tigers went 25-10 last year, and with Marcquise Reed, Shelton Mitchell, Elijah Thomas and others expected back, I don't see why they couldn't at least replicate that success. The big X factor in this game is Mississippi State. The Bulldogs were a talented NIT team last year, and return all six of their top scorers. Junior Quinndary Weatherspoon has All-American potential. Does that formula add up to a return to the Big Dance for the first time since 2009? Trae Young's official breakout last season came against Wichita State on the road when he dropped 29 points and hit four of his 11 3-point attempts. Though Young is now with the Hawks and OU figures to be less reliant on one individual, this regional matchup should be a fantastic one in an NBA venue in Oklahoma City. Both teams are undergoing an identity makeover this season, but both could realistically be sleepers come March. Duke-UNC and Kentucky-Louisville are rivalries that resonate with any sports fan, and rightfully so. Xavier-Cincinnati is No. 1 on the list of heated rivalries that should -- but don't -- resonate in the same way. Each time these two teams square off, you can, at minimum, expect some very passive aggressive postgame comments from one of the two coaches. And at most, you can expect a full-blown brawl. It's not often -- if ever -- you'll see Gonzaga face a team ranked higher than it is. And it's especially not often you'll see that team be Tennessee, which ranks No. 4 in our CBS Sports Top 25 (and one). We have Tennessee and Gonzaga at Nos. 4 and 5, respectively, and fortunately for hoops fans we'll get to watch them play one another on Dec. 9 in the Jerry Colangelo Classic. Tennessee returns most of its big pieces from its SEC regular-season title sharing squad, including Admiral Schofield and Grant Williams, and Gonzaga has Killian Tillie, Zach Norvell, Rui Hachimura, and Josh Perkins back. You can realistically expect both to be vying for No. 1 seeds come March, so this game should be an excellent March Madness preview. Kansas' magical NCAA Tournament run ended last season at the hands of the Villanova buzzsaw, but it holds the upperhand in this mid-December rematch. Not only do the Jayhawks have a more complete roster than Nova on paper, but they get to take on the Wildcats in one of the greatest venues in the sport in Allen Fieldhouse. There is no greater homecourt advantage than the one in Lawrence. Want to know how Hall of Famer Roy Williams plans to replace the production of seniors Joel Berry and Theo Pinson? Me too. But I'm confident the addition of five-star prospects Nassir Little and Coby White won't hurt. They're plug and play pieces that, alongside Luke Maye and Cameron Johnson, will make them a tough out -- even against a Gonzaga team that could easily win 30+ games next year. Gone are Gary Clark, Kyle Washington and Jacob Evans, but legendary coach Mick Cronin has plenty of pieces to work with to be a factor again next season. The Bearcats may not win 31 games again as they did last season, but they'll be a ... bear(cat) ... for Mississippi State to handle. Even in Starkville, this game figures to be a dogfight. Dana Altman is maybe enrolling his most talented freshman class ever in Eugene with potential one-and-done youngsters Bol Bol and Louis King leading the way. The Ducks will be a tough matchup for Baylor, which loses its top four scorers from last season. But Makai Mason, King McClure and Mario Kegler should help fill the production void. In this epic CBS Sports Classic between UNC and UK, we have a showdown between two of the most successful basketball programs in the history of the sport. The two schools have a combined 37 Final Four appearances and 14 NCAA Championships, and will duke it out on Dec. 22 when they meet up at the United Center in Chicago. Grab a glass of eggnog and watch the game in its entirety. You won't regret it. The loss of Peyton Aldridge stings for Davidson, but incredibly, Bob McKillop has another star on his hands in Kellan Grady, the leading returning scorer from last year's team. Grady, as a freshman last season, averaged 18.0 points, 3.3 rebounds and 1.9 assists per game behind Aldridge. He'll slip into the No. 1 role with ease this year, and a shot to play UNC on its home court could produce a big-time performance. He averaged 23.5 points over his final eight games last season, and should easily pick up where he left off. Kentucky-Louisville is one of the top-3 most heated college basketball rivalries, so no chance this one was slipping off the must-watch list. The game might not be particularly close -- Kentucky is a top-2 team entering 2018, and Louisville is entering Year One of the Chris Mack era in semi-rebuild mode -- but you know what? This game is always appointment television because, frankly, neither team likes the other.